It's not about Creationism. It's not about Darwinism. Humanity lies in Star Trek? Sure, why not! Put a Trek Fish on your car! It's not about Creationism. It's not about Darwinism. It's about the future! 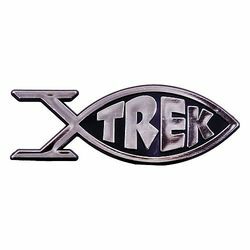 The Trek Fish Emblem simply says that we can continue to discuss our origins but, as a species, we should focus on what is to come. Show your support for humanity. Put a Trek Fish on your car! Emblem measures 5-inches in diameter, is made from plastic, and has a 3M adhesive pad on its back. Authentic, full-sized Gold Handle Phaser Pistol with detachable mini hand-phaser. It's a classic, officially licensed Star Trek series replica. Adjustable lights and sounds! This Exclusive Star Trek Tek Gold Handle Phaser is truly stun-ning. It's the original 2-in-1 design with detachable mini hand-phaser. The officially licensed Star Trek series weapon replica features a Type-1 mini hand-phaser that separates from the Type-2 pistol. For maximum authenticity, it's a full-scale reproduction modeled after the initial Star Trek prop. With realistic beam lights, sound effects, and adjustable power settings, this awesome replica is one of our bestselling items. You need one and so do all your friends. But remember: Always treat phasers as if they were fully loaded with nadions! 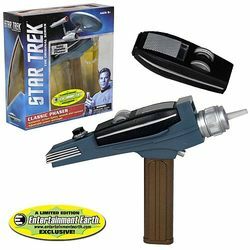 Measures 9 1/2-inches long x 9 1/2-inches tall x 3-inches wide.To activate the sound, you must remove the plastic display tab and turn on the hand-phaser. This is done by clicking the far right dial forward toward the front of the pistol. To trigger the lights, rotate the front dial forward. 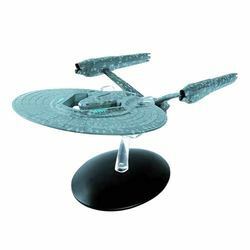 This special Star Trek Starships Collection Vehicle is one of the biggest and baddest Starfleet vessels ever designed - the U.S.S. Vengeance, the villainous warship that played a starring role in 2013's Star Trek Into Darkness. This oversized model has been produced at a larger size to reflect the huge size of the Vengeance and is nearly 8 1/2-inches long. Every detail of this heavily armed ship has been carefully reproduced with careful reference to the original CG model created by ILM. The accompanying magazine explores the design process and includes never-seen-before concept artwor﻿﻿k and all new interviews with the Vengeance's creators. Ages 14 and up.